Date: Wednesday, 6th November 1974. Competition: European Cup Second Round Second Leg. 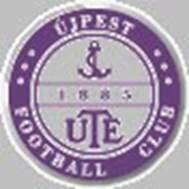 Score: Leeds United 3 Ujpest Dozsa 0. 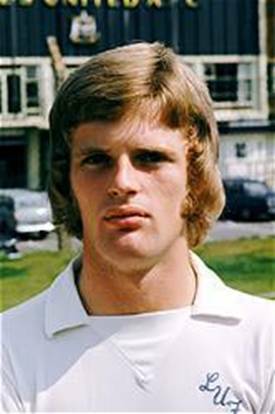 Scorers: Leeds United: McQueen, Bremner, Yorath. 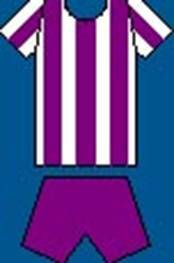 Ujpest Dozsa: Nil. 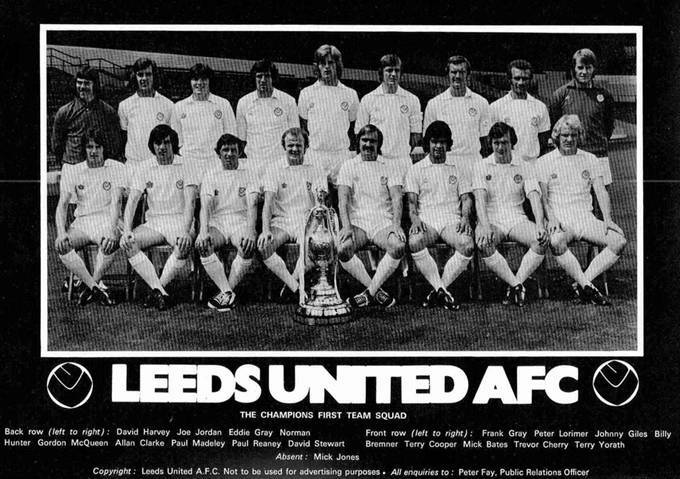 Leeds United: Harvey; Reaney, Cooper; Yorath, McQueen, Hunter (Cherry); Lorimer (Harris), Clarke, Bremner, Giles, Madeley. 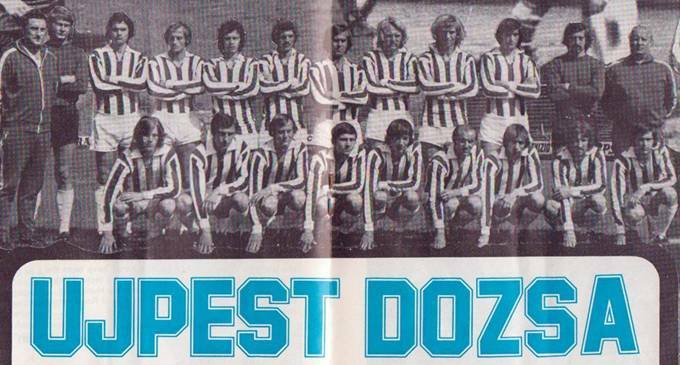 Ujpest Dozsa: Szigeti; Kolar, E.Dunai; Kellner, Zambo, Sarlos; Fekete (A. Dunai), Toth, Bene, Fazekas, Nagy (Torokcsik). 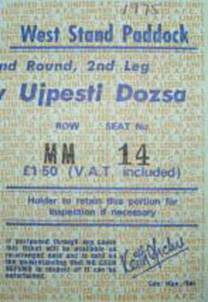 In the return leg at Elland Road of the European Cup Second Round tie with Ujpest Dozsa, United were comfortable winners. 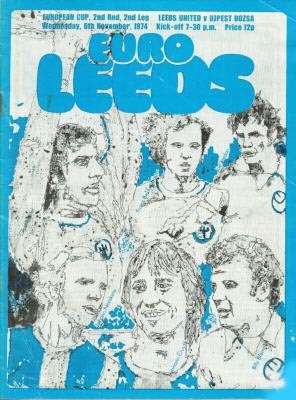 Billy Bremner made a fairy tale return against the Hungarians, making virtually his first appearance of the season, because of the long ban imposed for his Charity Shield Wembley confrontation with Kevin Keegan, the Leeds skipper had had barely one hour’s first team action since the opening day of the season. Typically he announced his return to the big-time with a goal in an easy 3-0 win over the Hungarian champions. Gordon McQueen gave United the lead on the night on twenty-eight minutes, when he got on the end of a well-flighted Johnny Giles free-kick to head in United’s one hundred and fiftieth goal in Europe. 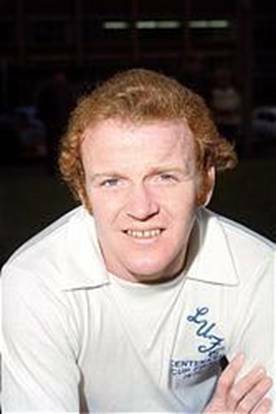 The single goal was all the lead United took into the half-time break, but one minute after the restart Billy Bremner doubled their lead after Terry Cooper had joined in United’s first attack of the second half and powered in a shot which was cleared at the expense of a corner. 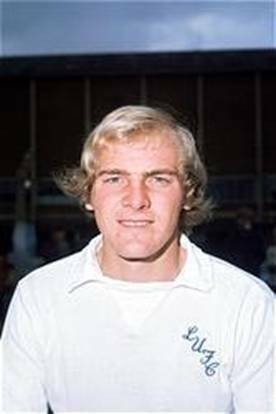 As the flag-kick was speared into the area, Terry Yorath, playing as a make-shift striker, headed the ball against the bar and there was Billy Bremner to head in the rebound after forty-six minutes. 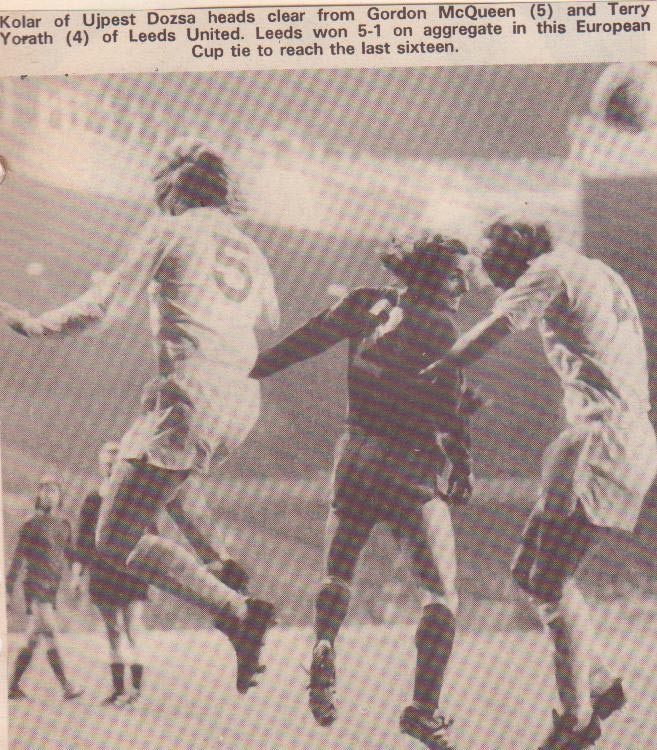 Crosses into the box had caused the Hungarians trouble all night and they were found wanting again in the sixty-fifth minute when Paul Madeley’s high centre was headed across goal by Allan Clarke and Terry Yorath applied the finishing touch to make it 3-0 on the night. The game in the bag Manager Jimmy Armfield introduced Carl Harris with twenty minutes to go. The young Welsh protégé had just turned eighteen the previous Sunday and United cruised into the Third Round with an emphatic 5-1 aggregate.